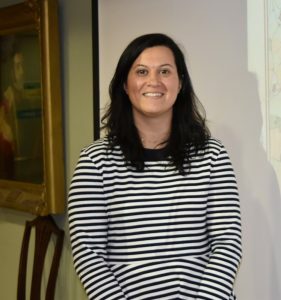 Dr.Deniz Türker of the University of Cambridge gave a very interesting lecture on Tuesday 15th May, entitled ‘The Yildiz Kiosk and the Queen Mothers of the Tanzimat Era: Gender, Landscape and Visibility’. She examined the patronage and the development of the site of the Yildiz Kiosk which Selim III (1789-1807) built for his mother Mihrişah Valide Sultan. The site was then further developed by the succeeding valide sultans Bezm Alim (1807-53) and Pertevniyal (1812-1883) who built additional kiosks, fountains and pavilions and created extensive gardens. She provided an illuminating insight into the work and activities of the Queen Mothers highlighting a part of that history has, in many ways, been hidden. 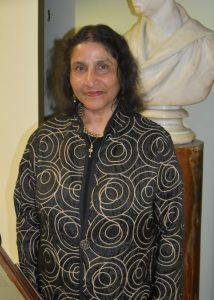 On Thursday 17th May, at a Guest Lecture, Dr Indira Viswanathan Peterson spoke on “Colonial Networks, Indian Elites, and the New Orientalism of the Royal Asiatic Society (1823-1840)”, suggesting that the Society’s projects involving its Asian members signaled a turn in British orientalism, toward the promotion of a new mix between antiquarianism and the ideology of improving the colonies through useful knowledge. This was exemplified, for instance, in the relationship between Raja Serfoji of Tanjore, an honorary member of the RAS as well as an enthusiastic orientalist and pioneering modernizer, and RAS Vice-President Sir Alexander Johnston; as well as other British administrator-orientalists in Madras and south India. Recently new catalogues for several sets of Personal Papers have been added to Archives Hub. One of these is definitely that of a hidden history. We have some papers belonging to Ram Gharib Chaube, who worked as a pandit for the folklorist, William Crooke. The papers consist of a set of Indian Religious Songs collected, transcribed and translated into English by Ram Gharib Chaube. Ram Gharib Chaube was probably born in the late 1850s into the traditional learned Chaube family. He graduated from the Presidency College, Calcutta, and was learned in both Indian tradition and the British colonial system of education, being fluent in dialects of Awadhi and Bhojpuri, as well as Hindi, Persian, Sanskrit and English. He became Mirzapur’s district collector of revenues and whilst there met William Crooke, who was keen to document Indian folklore. Impressed with Chaube’s abilities, Crooke asked that Chaube help in his work. Chaube probably continued to work with Crooke until Crooke’s departure for England in 1896. The material in these papers, therefore most likely dates from this time. Crooke continued to correspond with Chaube after his return to England. However he does not seem to have acknowledged Chaube’s contribution to his work. After Crooke’s departure Chaube also worked for V.A. Smith, and for G.A. Grierson’s Linguistic Survey of India. However he constantly struggled to earn enough money and satisfy his academic interests. He died in 1914 in Gopalpur. The life of Crooke and Rame Gharib Chaube has been well documented in In Quest of Indian Folktales: Pandit Ram Gharib Chaube and William Crooke by Sadhana Naithani (Indian University Press, 2006) from which these biographical details have been obtained. And we were pleased to be able to welcome Professor Naithani to the Society, a few weeks ago, to come and work with these papers. All new catalogues have the potential to allow researchers to gain more information into the histories of individuals and the times in which they lived. So William Edward David Allen, is certainly not a figure who has been hidden in history – indeed his has been a controversial name at times. However the material that was donated to the Society by Robin Allen, his son, on 23 July 1974, show Allen to be a man steeped in a love of the Caucasian region. William Edward David Allen was born in London in 1901 and educated at Eton before travelling and working in journalism. He had a lifelong passion for the history of the Caucasus region and in particular the Georgian area. He travelled much in the area and had an extensive library on Russian and Caucasian affairs. With Sir Oliver Wardrop, he founded the Georgian Society in 1930. 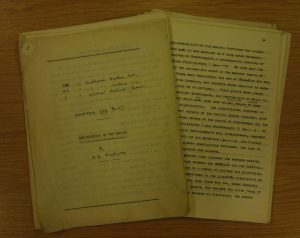 The material in these papers is concerned with his some of Allen’s literary endeavours and publications. He was known as Bill by his close friends and W.E.D. Allen in official correspondence and publication. This is seen within these papers. The papers were arranged in folders with titles when they were given to the Society and this arrangement has been kept in the cataloguing. So we find within these papers is correspondence with Peter Skelton, with Vladimir and Tatiana Minorsky, with Terence Gray and his wife Natalie Margaret Imeretinsky, with Terence Edward Armstrong, and with Humphrey Higgens. All this correspondence can add to the understanding of W.E.D. Allen, and to the interest in Georgian history in the time period 1953-1973. Letter from Vladimir Minorsky to W.E.D. 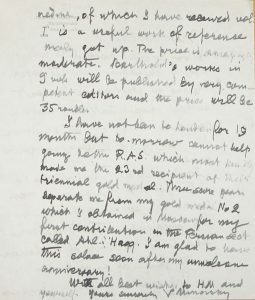 Allen in which Minorsky writes that he is to go to London on the following day to receive the Triennial Gold Medal of the Royal Asiatic Society. Dated: 9 May 1962. 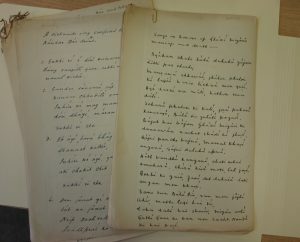 Also recently added is the catalogue for a small collection of Papers belonging to Hugh George Rawlinson. He was born in Middlesborough in 1880 and went, as a scholar, to Emmanuel College, Cambridge. He graduated with a First Class degree in the Classics Tripos and gained the Hare University Prize. In 1903 he joined the Education Service of the Government of Ceylon and in 1908 moved to the Indian Education Service. He became Principal of the Karnatak College in Dharwar and later, Principal of Deccan College in Poona, where he stayed until his retirement in 1933. The Kingdoms of the Deccan – an incomplete manuscript with annotated heading Chapter XXII Part I, and “By H.G. Rawlinson”. It has 110 numbered pages and has further inserted pages. Typed with handwritten annotations. Rawlinson was a prolific writer about Indian history and related themes and also acted as editor for several volumes. On his return to England he lectured in Classics at Birkbeck College, London. He was a Member of the Royal Asiatic Society from 1944-1954 and wrote an article, “Indian Influences on Western Culture” (JRAS 1947, pp.142-150) for the Journal of the Society. He died, in London, on 8 June 1857. The papers consists of drafts of articles and chapters reflecting some of his interest in Indian history. It is unknown how these came to be in the Society’s archives, but maybe, now that their catalogue is available, they might add a small piece of information concerning the study of India in the early 20th century. Finally the catalogue for the Royal Asiatic Society’s Public School Medal is also available on Archives Hub. 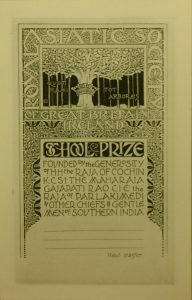 In October 1901 the Council of the Royal Asiatic Society agreed to invite a number of Indian Princes to support the Triennial Gold Medal Fund. The appeal was organised by Mr H.A. Sim of the Madras Civil Service to which some 13 chiefs and gentlemen of India responded with contributions totalling £1270. But in 1902, the Council determined that sufficient funds had already been received from Great Britain to support the Triennial Gold Medal. It was therefore determined that the interest derived from the Madras appeal should be divided between a fund for School Medals and a fund for the publication of monographs. 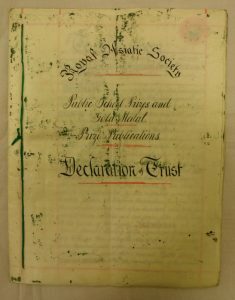 Declaration of Trust Document for the Public School Prizes and Gold Medal; and Prize Publications for the Royal Asiatic Society. Dated to 1907. A medal committee recommended that the new schools’ award should be smaller in size than the Triennial Medal. The symbol of a sun rising from the Eastern Sea and the motto, EX ORIENTE LUX, both originally used for the Oriental Translation Fund, would be on the medal, with the reverse bearing a laurel wreath and the words: ROYAL ASIATIC SOCIETY – INDIAN EMPIRE SCHOOL MEDAL. Initially it was called the Indian Empire School Medal but in 1905 it was decided that the prize should be called “The Royal Asiatic Society Public School Medal” and would be awarded yearly to a boy from a Public school who submitted the best paper on an oriental subject chosen by a committee. The medal, originally of gold, measured 3.5cm in diameter. Initially only boys from Eton, Harrow, Winchester, Rugby, Charterhouse, Westminster and Merchant Taylors’ School were eligible to compete, but in succeeding years the list was gradually increased to include almost all the public schools in Britain. A new trust deed and schedule was approved in 1907. This provided for an award of a book-prize to the boy from each competing school whose essay was judged to be of a high standard, with the author of the best essay being awarded the medal. Each book, on an oriental theme would be provided with a book plate. 1904 – William Norman Ewer (Merchant Taylors’ School) who later became a foreign affairs journalist. 1905 – Edward William Horner (Eton College) who became a lawyer but was killed in action in WWI. 1906 – Leonard Fielding Nalder (Rugby School) who became a colonial governor in Sudan. 1907 – Alexander Percival Waterfield (Westminster School) who pursued a civil service career culminating in becoming the first civil service commissioner in 1939 with subsequent knighthood in 1944. 1908 – Hugh Kingsmill Lunn (Harrow School) who after serving in WWI and being held prisoner in France, became a successful journalist and author. 1909 – A.H.M Wedderburn (Eton College) who in 1912 rowed in the Oxford University eight and was President of the Union. He also served in WWI but survived. 1910 – Edward Richard Buxton Shanks (Merchant Taylors’ School) who also became a writer and a journalist. 1911 – Arthur Lewis Jenkins (Marlborough College), a scholarship boy both at school and Balliol, he joined the Light Infantry in 1914, serving in India, Aden and Palestine, before joining the flying corps serving in Egypt. He died in 1917 on patrol duty in England. 1912 – Harold Francis Amboor Keating (Eton College), born in Australia but died, serving in WWI, in France in June 1918. 1918 – Hubert Miles Gladwyn Jebb (Eton College) who entered the diplomatic service in 1924, served for a short time as Acting Secretary-General for the United Nations in 1945, and was knighted in 1949. 1920 – Oliver Martin Wilson Warner (Denstone College) who became a British naval historian and writer. 1921 – G.F. Hudson (Shrewsbury School) who became a historian and author. 1922 – Seymour Joly de Lotbiniere (Eton College) who became a Director of the British Broadcasting Corporation and masteminded the televising of the Queen’s Coronation in 1953. 1923 – D.E.F.C. Binyon (Westminster School), nephew of Laurence Binyon. 1926 – Kenneth Adam (Nottingham High School) who became a journalist and broadcasting executive, and from 1957 until 1961 served as the Controller of the BBC Television Service. 1929 – Charles Leslie Rosenheim (Bromsgrove School), younger brother of Baron Max Leonard Rosenheim, he joined the army in WWII and was killed in 1945. This coming week we welcome Dr Susan Whitfield who will lecture on “Silk, Slaves and Stupas: Material Culture of the Silk Road”, when, no doubt, some more hidden history will be revealed. The lecture takes place on Thursday 24th May at 6.30 pm, and we hope you will be able to join us for this event.